delboden (which means the 'noble floor') is a lovely village on a terrace at the end of a valley and shares with Lenk an impressive terrain This includes a good park for boarders, the GMP (Gran Masta Park) on Hahnenmoos - indeed this is one of the best resorts in Switzerland for boarders. 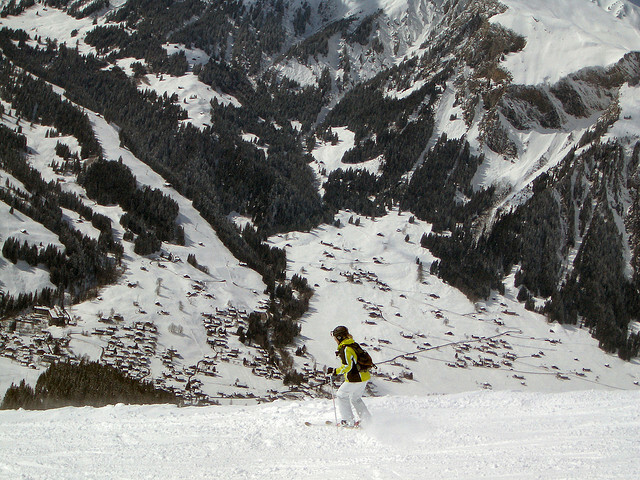 In addition to the main pistes there are a number of smaller areas nearby that are covered by the lift pass. Adelboden was the destination for Sir Henry Lunn's first winter package holiday, but it has slipped from favour for reasons which are hard to fathom, since it has a fabulous variety of good slopes and a better snow record than you might expect. Although the night life is generally relaxed, there are plenty of diversions away from the slopes and this is a good destination for people who neither ski nor snowboard. The atmosphere in the resort really kicks off in early January when the World Cup Slalom and Giant Slalom come to the Chuenisbärgli to provide one of the toughest challenges on the whole International Ski Federation (FIS) circuit, and there is a vibrant party atmosphere throughout the week. The Hörnli Trail is an easy 6km winter walk along a cleared, marked trail from the northern end of the main street in Adelboden with beautiful views all along the route until it brings you back into the village. The main slopes are easily accessible from Adelboden, including the World Cup run down Chuenisbärgli. 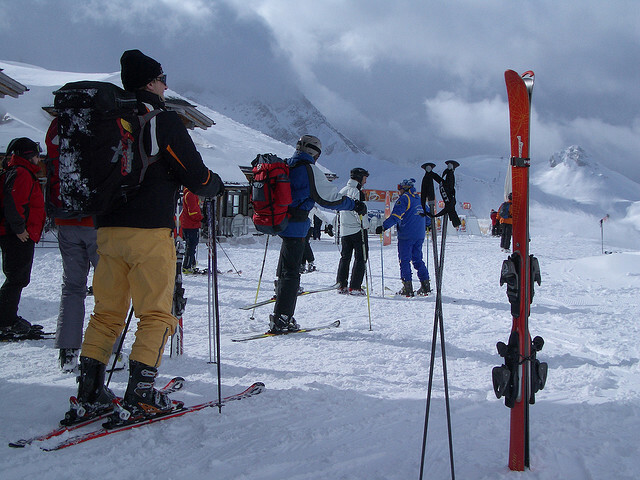 The resort has a good range of pistes for all abilities, with most of the challenging runs above Geils. There are a few long runs but some of them are flattish in places, and the best of the longer runs is probably the 5.5km, 700m drop from Lavey to Aebi. There is plenty of off-piste - I liked the sections that drop off Red route 85 down to Bergläger. The bus ride out to the pistes at Engstligenalp are worth the round trip. A bus runs regularly on the half hour from Adelboden bus station to Unter dem Birg at Engstligenalp in about 20 minutes and there is ample free parking at the bottom station. With a designated free-ride area (which has it's own Facebook group!) and the longest season in the area, the Engstligenalp plateau is a good place for reliable, untracked snow and ski touring. The area is never crowded, the only real drawback being you need to take the cable car back down at the end of the day. The Elsigen-Metsch ski area is particularly convenient for Frutigen and provide the closest slopes for people driving into the area, with roughly 30km of pistes and a larger drop than that at Adelboden itself. The runs at Elsigenalp (2344m) and Metschalp (2142m) are accessible from the lift at Elsigbach which also has ample free parking. A bus runs from Frutigen to Elsigbach during the winter every hour. Tschentenalp is just above Adelboden and has long cruisy runs with extensive off piste. There is also a relatively easy, if narrow, unpatrolled trail back into Adelboden. Recommended for mountain eating is Restaurant Aebi (+41 33 673 13 56) on the Aebi-Oey piste. A good place to rendezvous is the Wunderbar on the Hahnenmoos-Geils piste. In the evening the Berna Bar and Alte Taverne are the watering holes of choice. The best destination to access the downhill slopes by public transport in this ski area is Adelboden, Mineralquelle. Bus stop is 3 minutes from Oey gondola to access the main pistes - do not get off at earlier Oey bus stop. There are local buses to the other ski areas covered by the lift pass. The resort operates the Snow'n'Rail scheme, providing a 20% discount on the combined travel ticket and lift pass. From Zurich the least travel time is 2 hrs 32 mins with as few as 2 changes going via Bern / Frutigen. Typically, an adult one day combined ticket is 184.80 SFr, reduced to 121.20 SFr with a Half-Price card. From Basel the least travel time is 2 hrs 35 mins with as few as 2 changes going via Bern / Frutigen. Typically, an adult one day combined ticket is 173.60 SFr, reduced to 115.60 SFr with a Half-Price card. The road distance from Zurich is around 163 km and the journey time is roughly 2 hrs 10 mins. The road distance from Basel is around 158 km and the journey time is roughly 2 hrs. The road distance from Berne is around 65 km and the journey time is roughly 1 hr. The road distance from Geneva is around 236 km and the journey time is roughly 2 hrs 45 mins. The road distance from Lausanne is around 172 km and the journey time is roughly 2 hrs. 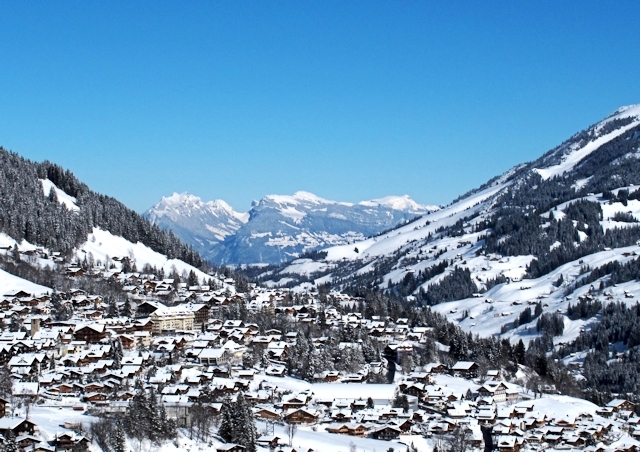 Other resorts in the ski area include Kandersteg, Lenk i. S. and Gstaad.